How to speak cat: Why do cats meow? Some cats can be quite chatty with their owners, but it is often difficult to understand what they are actually trying to say. From a howling meow to a short chirrup, they can make a wide range of different noises to communicate their mood, so to help you decipher their complex language we have put together a handy cat chat guide. Is it ‘miaow’ or ‘meow’? Miaow is actually the umbrella term used for a group of cat sounds, including the meow and mew. You can find out more about the meanings of these particular sounds below, but if you’re in doubt about what sound your cat is making, just use ‘miaow’. Meowing isn’t actually used by cats very often to communicate with each other. Instead it is a learned behaviour that they use primarily to communicate with humans, as it usually gets a positive response. For example, if a cat meows and their owner takes it to mean they are hungry, they will provide them with food. The cat then knows that if they use that meow again, they will get fed. This is why a cat will usually develop their own specific range of meows that their owner comes to recognise, such as a short meow for attention and a longer meow for food. Mew is the name for the cry of a kitten, which it uses to tell the queen (mother cat) that it is hungry or in distress. They begin making this sound a few days after birth but typically stop when they are around two to three months old. This short trill is usually used by queens when they call for their kittens, but many domestic cats also use it as a way of greeting humans. A gentle purr is used by queens and their kittens as a way to let each other know that all is well. Adult cats also purr when they’re feeling content, but a more urgent higher-pitched purr could be a signal for attention instead. *Purring can also be a sign that a cat is in pain, so pay close attention to the context of their purr and if you’re worried then seek advice from the vet. Cats will growl if they feel threatened, using it as a warning that they will attack if the threat persists. As cats are solitary animal, they typically use low-pitched growling as a way to make themselves more intimidating to humans and other cats, encouraging them to stay away. Hissing and spitting are defensive behaviours in cats, used to deter any perceived enemy that may be approaching. 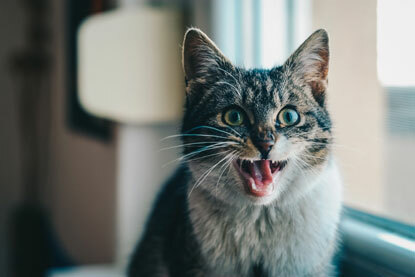 If a cat is hissing, you should leave them alone as it is likely to be warning that they are about to scratch or bite. If you have noticed a change in the type or frequency of sounds your cat is making, it is best to take them to the vet to rule out any underlying health problems, as it could be a sign that they are in pain. As far as I concern, maybe i am wrong, but the cats only meow to human. Among themselves, or cat to cat communication, they just do not make any sound at all, UNLESS the cats are having quarrel situation or something like we can say, act of to show dominance for a place or something.But for me, a Meow sound each morning, is just an alarm clock for me. They can occasionally make noise to each other but it's usually a mother to kittens or as you mentioned, defensive/threats. Is your cat left- or right-pawed? Speak up for cats on air gun licensing: Act now!